Jurgen Klopp expects a tough test for his Liverpool side in Portugal next week after they battled to a 2-0 win against Porto in the first leg of their Champions League quarterfinal. First-half goals from Naby Keita and Roberto Firmino have left the Reds ninety minutes away from the last four, but Porto should not be discounted after thwarting their opponents' efforts to build an unassailable margin and posing a consistent threat themselves. 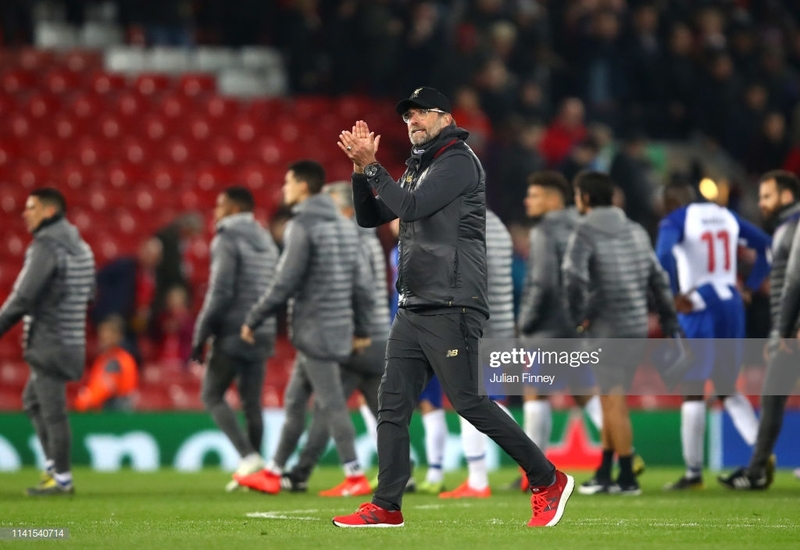 Klopp blamed a lack of 'rhythm and direction' for his team's failure to add to their lead but remained pleased with the result. "I'm happy," he told BT Sport. "It's the first leg and it will be an intense second game for sure. "We scored wonderful goals, we controlled the game most of the time. We gave a few too many set pieces away - they're really strong in that. I think they score around forty percent of their goals from set pieces. "They had a lot, it was quite uncomfortable but we defended them well. They had one or two counterattacks, but no more. "Second half we lost a little bit of rhythm and direction. We should have played more in-behind. The boys were ready up front, but we didn't play the balls anymore. We didn't use the right wing in the same way we did in the first half. It's nothing to criticise, it was just obvious. "Two-nil is a very, very good result, but the game is still on." Liverpool, meanwhile, will be slightly relieved to come away without conceding any away goals after Moussa Marega squandered two big chances. Klopp says the striker's missed opportunities instilled more caution in his team. "It was probably like that," he replied when asked if the two teams looked happy with the result. "We gave these little situations away where we had one-on-ones. When we didn't push up in the last line, they chipped the ball in-behind, and the striker was not alone in front of the goal but he had a promising situation at least. "Situations like this always have a little bit of an impact, you could see that. But we didn't give a lot away." Mohamed Salah may not have found the net but he, along with skipper Jordan Henderson, was singled out for praise by the Reds boss. Salah looked menacing throughout, while Henderson produced an incisive pass to Trent Alexander-Arnold in the lead-up to Liverpool's slick second. "Mo played an outstanding game on the right wing, he was pretty much unplayable. Together with Hendo there that was brilliant. "The second goal was a world-class goal, really nice play after a counter-pressing situation." Klopp was keen to stress that he did not expect the tie to be settled at this stage and has warned his players to be prepared for an 'intense atmosphere' at the Estadio do Dragao next Wednesday. "We knew we would have to play the second game, that's how it is. We are long enough in the business now [to know] we cannot decide it here. We have to go there and fight again. "Porto will strike back, one hundred percent. It will be a really intense atmosphere there, and we have to be ready for that, but I'm pretty sure we are." Up first for Liverpool, though, is a meeting with Chelsea on Sunday afternoon - a game that could prove vital in the Premier League title race.